And yet, those who know the epic English poems Paradise Lost and Paradise Regained—heavily influenced by Dante’s work—may find John Milton a more apt comparison. Milton also made complex uses of theology as political allegory, and wrote political tracts as passionate and resolute as his poetry. Both Milton and Dante were intensely partisan writers who expanded their worldly conflicts into the eternal realms of heaven and hell. Like Milton, Dante’s formative political experience involved a civil war---in his case between two factions known as the Guelphs and the Ghibellines (then further between the “White Guelphs” and the “Black Guelphs.”) And like Milton, Dante had special access to the powerful of his day. Unlike the English poet and defender of regicide, however, Dante was a strict monarchist who even went so far as to propose a global monarchy under Holy Roman Emperor Henry VII. And while Milton veiled his political references in allegorical symbolism, Dante boldly named his adversaries in his poem, and subjected them to grisly, inventive tortures in his vivid depiction of hell. The Inferno treats the existence of hell and the grievous sins that consign its inhabitants there with the utmost seriousness. And yet, the presence of Dante’s many personal and political enemies injects no small amount of dark humor into the poem, such that one can read it as political satire as well as an ingenious marriage of medieval Catholic theology and philosophy with the poetry of courtly love. The richness of the Divine Comedy’s rhetorical world invites a great many interpretations, but it also demands much of its reader. 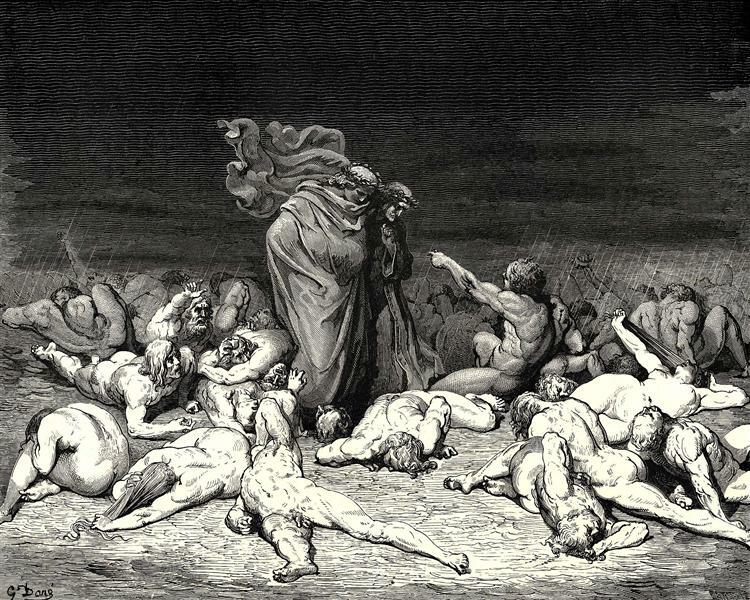 To meet its challenge, we might lean on excellent reference guides like the online World of Dante, which offers a fully annotated text in English and Italian, as well as maps, charts, and diagrams of the hellish world, and visual interpretations like Gustave Doré's illustration from Canto 6 at the top. And we might listen to the poem read aloud. Here, we have one reading of Cantos I-VIII of the Inferno by poet John Ciardi, from his translation of the poem for a Signet Classics Edition. Ciardi (known as "Mr. Poet" during his day) made his recording in 1954 for Smithsonian Folkways records, and the liner notes of the LP, which you can download here, contain the excerpted “verse rendering for the modern reader.” The translation preserves Dante’s terza rima in very eloquent, yet accessible language, fitting given Dante's own use and defense of the vernacular. You can hear the complete reading on Spotify (download the software here) or on Youtube just above. Ciardi's reading will be added to our collection, 1,000 Free Audio Books: Download Great Books for Free. You can also find a course on Dante (from Yale) in our collection, 1,300 Free Online Courses from Top Universities.